Home Graphics Digital Printing Wrap Party! 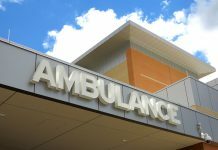 Most exterior building wraps involve covering a wall or two in highly visible, highly strategic spots. Then there are those rare gargantuan wraps that cover the entire building from top to bottom. One sign shop recently worked on a project of this size to help an international ladder company take their tradeshow event to new heights. The Specialty Tools & Fasteners Distributors Association (STAFDA) serves the construction/industrial market, and its annual STAFDA Convention is geared toward the hardware and installation markets. The forty-first edition of this event was held last November in Austin, Texas. 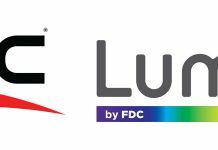 WernerCo® is a worldwide manufacturer and distributor of specially branded ladders, ladder accessories, and climbing equipment, and the STAFDA Convention is a big tradeshow for them each year. Over the past several years, they have held off-premise private parties at this event for their hardware customers, select convention attendees, and key decision makers. For the Austin convention, they hosted a party at the Coppertank Event Center, a 100-plus-year-old brick building located in the heart of downtown Austin that had been converted into a trendy event space. As you’ve probably heard, “everything is bigger in Texas,” and WernerCo had equally big ideas for this event: They wanted to wrap the exterior of the 12,000-square-foot building for maximum brand visibility, and in turn, offer a unique environmental experience like had never been encountered there before. The marketing team at WernerCo reached out to FASTSIGNS in Elk Grove Village, Illinois to see if they would be able to print and install this short-term, branded vinyl wrap for an entire building. “We told them that we could, and as soon as we got off the phone, we immediately had to figure out exactly how we were going to do this,” chuckles Owner David Becker. Becker has been involved with the FASTSIGNS network for fourteen years, first starting his Arlington Heights location from the ground up and consistently growing it over the years. He added ownership three-and-a-half years ago of the nearby Elk Grove Village location, recognizing he could help turn it around after a period of underperformance. His office is located a mile away from the runways of O’Hare Airport in Chicago, and as a result, his shop has found success serving the needs of manufacturing and transportation logistics companies. One of these companies is WernerCo. WernerCo provided FASTSIGNS with a photo of the Coppertank Event Center building with a mock-up of their branding concepts placed on it, showing how it would look. Becker was tasked with material selection, printing, shipping, and overseeing the installation and removal of all the vinyl. Becker called the owner of the Coppertank Event Center and learned some challenging news. 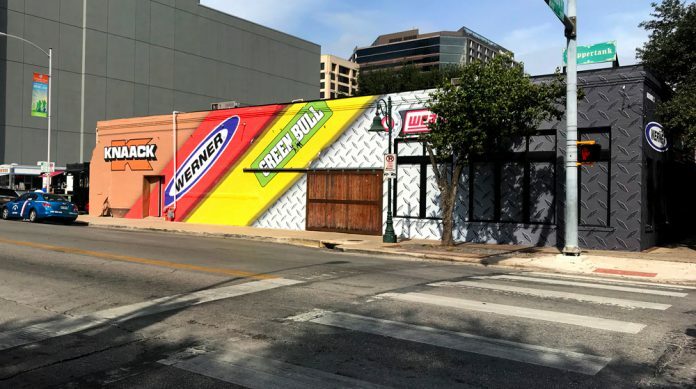 One of the big events held each year in Austin is the SXSW music festival, and the prior spring, a record company had painted the entire Coppertank building black and then brought in a mural artist to paint a record album cover on a wall for a Foster the People release party. 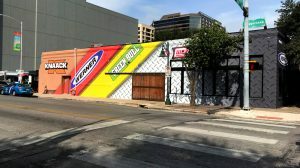 “The owner told me that he didn’t care what we put on the building, but when it was removed, it couldn’t remove any paint off because he had spent $10,000 on the record mural. As soon as he told me that, I thought, ‘Well, there go half of my ideas,” laughs Becker. This meant the building wrap had to be temporary and removed the day after with no damage to the historic building. After research and calling around to other FASTSIGNS owners, Becker opted to use Photo Tex™ (OPA), a peel-and-stick adhesive made of polyester fabric, since it takes thirty days to fully set up and is removable within the same year. Pre-planning is key to completing large projects, but imagine the obstacles of trying to set up a job of this magnitude from 560 miles away. One of the biggest challenges for a printer is getting a client to understand the resolution needed to reproduce in grand and wide format sizes. It can get messy. Although initial images were sent to his shop sort of inverted (75-dpi at 50 percent size instead of 200-dpi at 25 percent size, which required finagling), Becker knew the logos were going to be the money shots, so he made sure they were sent in a vector format to guarantee they would show up crisp and sharp on the building. Becker used his two HP L360 Latex printers at his two locations to print all the graphics overnight. “We printed to fifty-two inches with a one-inch overlap on 54-inch-by-100-foot rolls,” recalls Becker, noting they printed seven rolls and shipped them separately in boxes clearly marked with where they were to be installed. Becker says that this was one of the most complex installation projects his shop had ever done. “Wrapping a building is not something I do every day,” he says. Fernandez pointed Becker to Archer Sign Installation, who had prior experience wrapping buildings. Becker and two of his installers flew down and teamed up with the three-person Archer Sign Installation team to apply the building wraps with knives, squeegees, tapes, etc., via ladders and rented scissor lifts. Each team started at opposite corners of the building and wrapped until they met. About 3,100 square feet of Photo Tex was used for the exterior, and it took two ten-hour workdays to finish. 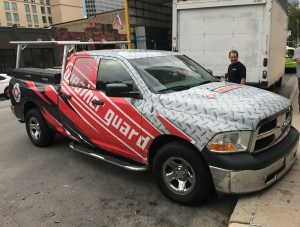 The thirty arrow-shaped concrete sidewalk graphics directing people from the hotels and convention center to the venue were printed and die-cut onto AlumiGraphics aluminum-based foil decal print media coated with AlumiGrip®. 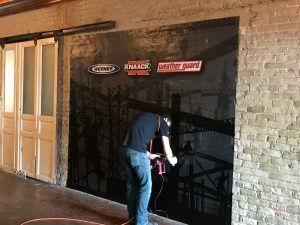 The two backdrops for the interior wall mural were printed onto 3M IJ35C vinyl, while the two logo-branded trucks (brought in by two local dealers) were covered with 3M IJ-180 vinyl. All the event signage was removed the morning following the party. The main wrap came down in less than two hours with no damage to the building. The concrete graphics were easy to remove thanks to their short-term use. Becker now has even more confidence in managing large projects remotely, and this project has further deepened his relationship with WernerCo.